Emily Rozmus (left) and Amy Boeck of Our Saviour Church, Mechanicsburg, won the second annual adult spelling bee hosted by the Champaign County Children’s Literacy Foundation. Pictured as the “bee” is Bailey Burden. The Champaign County Children’s Literacy Foundation held their second annual Adult Spelling Bee on Thursday, March 14, 2019 in the Sara Landess Room at Urbana University. Eighteen teams competed this year for the big Bee Trophy. Participants enjoyed a free taco bar during the many rounds of masterful spelling. The final two teams were Graham Local Schools “Highway to Spell” team and the Church of our Saviour of Mechanicsburg. The Church of Our Saviour ladies won it all. They were only a team of two ladies, Emily Rozmus and Amy Boeck, but they prevailed. The fun-filled evening brought in around $3,800 for the Champaign County Children’s Literacy Foundation. Event sponsors were Urbana University, The Peoples Savings Bank, Michael Farms, Champaign Berry Farm, Brecount Law Office, KTH Parts & Industries, Tri-County Insurance and the Urbana United Methodist Church. The Champaign County Children’s Literacy Foundation is always seeking mentors for the elementary school mentoring program. For additional information on the mentoring program or the Champaign County Children’s Literacy Foundation, please contact Jennifer Harvey at Jennifer.harvey@mccesc.org. 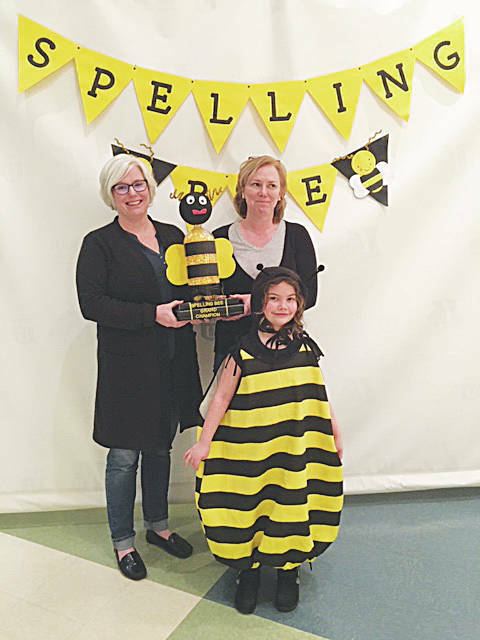 https://www.urbanacitizen.com/wp-content/uploads/sites/36/2019/04/web1_BeeWinners.jpgEmily Rozmus (left) and Amy Boeck of Our Saviour Church, Mechanicsburg, won the second annual adult spelling bee hosted by the Champaign County Children’s Literacy Foundation. Pictured as the “bee” is Bailey Burden.